We thank you, our customers, for your active participation in our spring auctions 2019, which ended Friday evening at 6 pm with great success. In total, more than 2,500 bidders participated in the sale. We were very pleased with the overall hammer price of more than 9 million euros (total estimate 5.9 million euros). A result we are very proud of and for which we would like to sincerely thank everybody that participated in the sale! 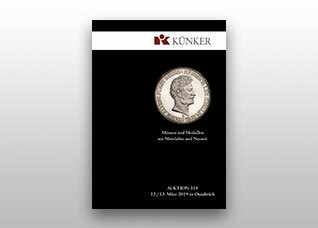 On Monday, the auction started at 10 o'clock with the ancient coins and the collections Dr. W.R., Part II and Dr. Klaus Berthold collection. While thick snowflakes fell from the sky outside in Osnabruck, the auction room was filled to the last seat. Numerous bidding battles led to many high results and thus to a late end of the auction. The two well assembled collections, which contained many rarities, improved significantly compared to the estimate. 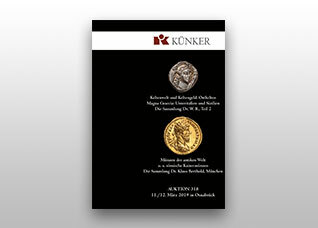 The Berthold collection with selected coins from the Roman times even doubled in comparison to the estimate! 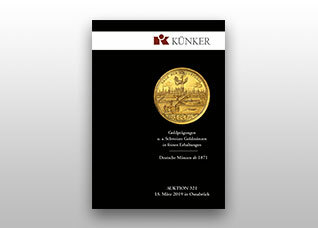 On Thursday, the Heinz Thormann collection with coins, medals, and tokens from the German state of Anhalt (catalogue #320) was sold here in the auction room. Above all, the bracteates from this very extensive special collection, which was built up since 1970 with a lot of expertise, achieved record prices. Once again we were able to prove that we are the right address to sell special collections. If you have beautiful or rare individual pieces or an extensive collection and think about submitting them to an auction, please contact us. For our auctions in Berlin and Osnabruck, we are always happy to accept consignments. For today we say goodbye from the sale room here in Osnabruck. Our next auctions, the Künker Summer Sales will take place from 24th.-28th.of June 2019. Our next eLive Auction will take place from 7th - 9th of May, and will be available for viewing starting on April 19th on our website www.elive-auction.de.